We already discussed the main purpose of the post in WordPress. But there is a lot more to them. Every post and page in a site have their permalinks(or permanent links). They could look similar to this one http://www.yoursite.com/?p=183. Of course, like almost everything in WordPress you can change that so that the permalinks becomes readable for a human. Something like http://www.yoursite.com/my-first-steps-in-wordpress/. To do that you have to go to Settings->Permalinks and choose the option that suits you best. Post slug is the part of the permalink, but while the permalink is represented by the URL as a whole, the slug is only the last part of it. For example http://www.yoursite.com/my-first-steps-in-wordpress/ this is the slug. If the link was changed somehow, say there was a category involved. Then it would look something like http://www.yoursite.com/wordpress-journey/my-first-steps-in-wordpress/. Again, the last part is the slug, the whole is the permalink. Find out more about slugs in WordPress. The post thumbnail or the featured image is the representative image for the post. In the news websites, the online magazines, and virtually every blog out there, when you scroll through the articles you’ll see that every one of them has an image. That image we call Featured. In WordPress posts can have a status. Depending on the post’s level of completion it could be in Draft, Pending Review or Published. Before we start, let’s make it clear from the beginning that not all themes support all post types, or any of them for that matter (except the standard post type, of course). In some themes, you will have the option to choose the post type in others – no. If you really need that option, you can use the Feature Filter when searching for a theme and check the feature you want. In this case, it is Post Format. Bear in mind also, that if the theme supports Post Format, it may or may not support all of them. After we made that clear let’s examine the different post types. 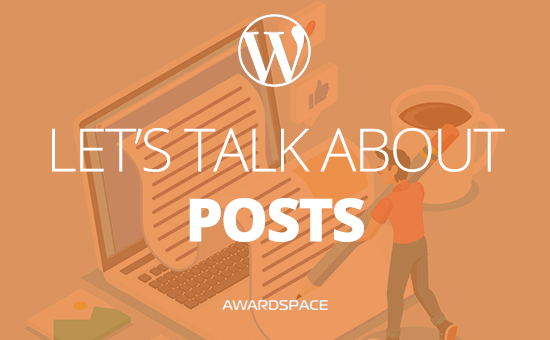 Standard Post Format – This is the default post format in WordPress. As we already know, you can use this post type as a blog post, article or pretty much anything you want. Bear in mind that this format could be used as all the others. It could contain a gallery, video or something else. Aside – Do you have a little note-like information you want to share with your audience? Why don’t you create an Aside post? An interesting piece of information that would not fit in your content otherwise is very suitable for this kind of post. Gallery – You can create a post or page that contains only images. Such a post format could contain not one but two or more Galleries. Link – The link post format is basically used when you want to share a link (internal or external). Just add the title and you are good to go. Optionally you can add commentary. Image – If you want to share a single image with your audience, this is the post format you should use. Quote Post Format – If you want to share a quote that is not within an article this is the perfect post format. Status Post Format – The status post format is a great tool if you want to share a short status, similar to a status in any social networks. In fact, it is not necessary for those posts to be short, although status updates are often perceived as short pieces of content. Video Post Format – Video post format contains embedded or uploaded to the site video file. Audio Post Format – This post types could contain embedded or uploaded to the site audio file. Chat – This is the post format you need to use if you want to display a chat transcript. Now, let’s enter the WordPress Admin Panel and make the magic happen!